My poor bedroom has been neglected. We inherited a hand-me-down guest bedroom set of furniture 7 years ago when we got married, and while I greatly appreciated having somewhere to sleep, it probably wasn't what I would have picked out myself. I decided I should finally start building us a new set, and here is the first piece. 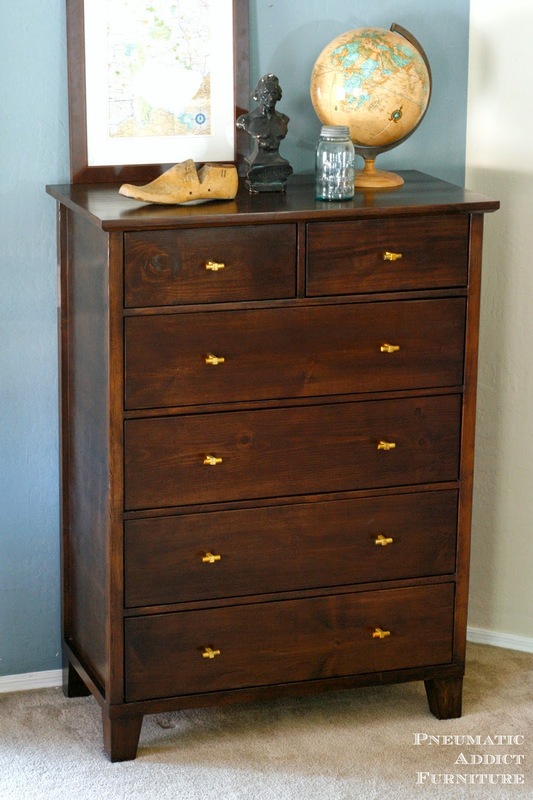 While window shopping through the Pottery Barn website, I came across the Valencia tall dresser. I liked the clean lines of the tapered feet and inset drawer faces. I talked with my good friend Amy from Her Tool Belt, who graciously offered to sketch up the building plans. Click over to get your own free set of plans, and read below to get the details. 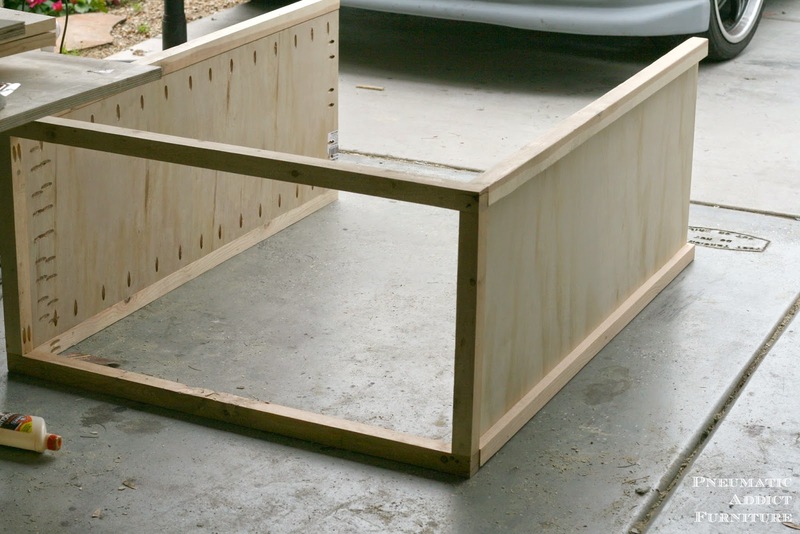 To start, I put together a rectangle of 2 x 2's, using my *Kreg Jig, glue, and *pocket-hole screws. This gave me the bottom piece of the frame. Next, I started on the side panels. I got a little carried away with the pocket holes, but you know what they say? "When in doubt, build it stout." I used a couple pieces of scrap wood, 3/4" thick underneath my plywood panel, causing the plywood to sit flush with the tops of the 2 x 2 legs. This is the backside of the plywood. 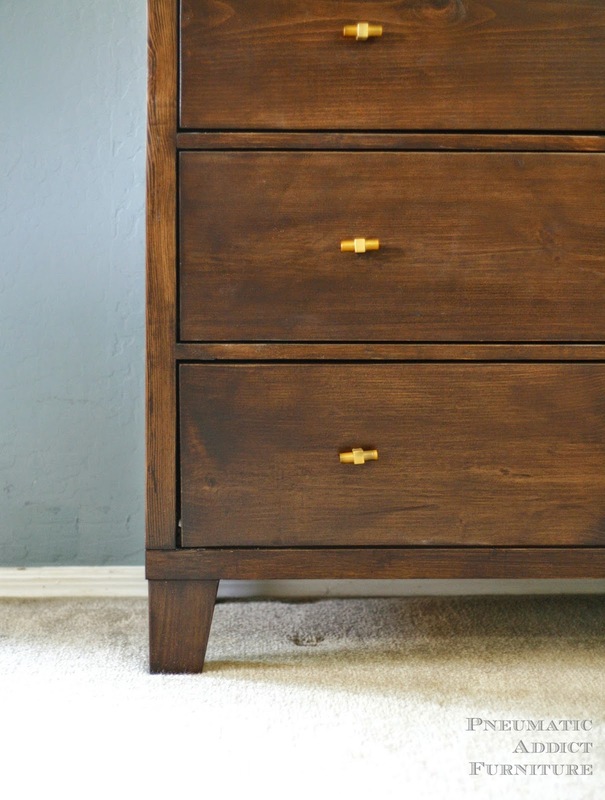 When I flipped it over, I had a nice 3/4" inset from the outside edge of the dresser. 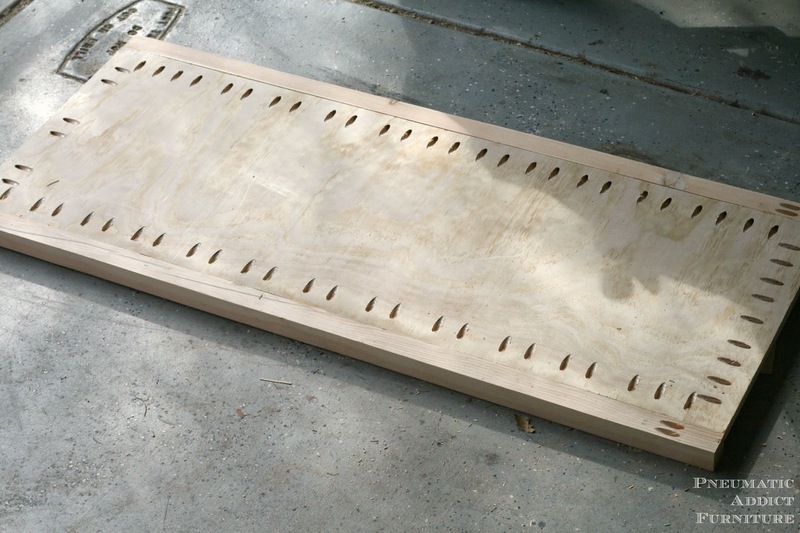 I repeated the same steps to create a second side panel. Using more pocket holes and glue, I attached both side panels to the bottom, rectangular frame. Make sure pocket holes face inward. 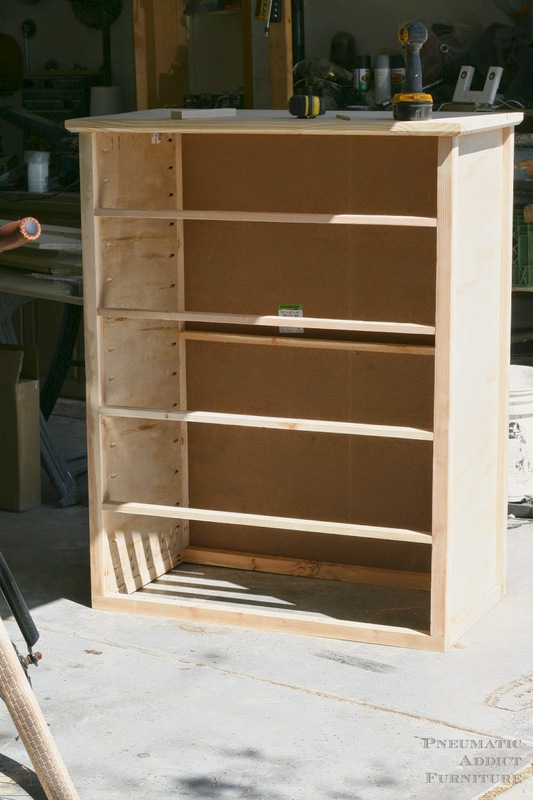 In the plans, Amy shows how to create a top from plywood with wood trim. Lucky for me, I have a hoard stash of old table tops and other random furniture body parts in my garage. I've mentioned before what a good idea it is to pick up cheap, used dining tables whenever you come across them. I'm always on the prowel for a solid wood table top when I drive past a yard sale. 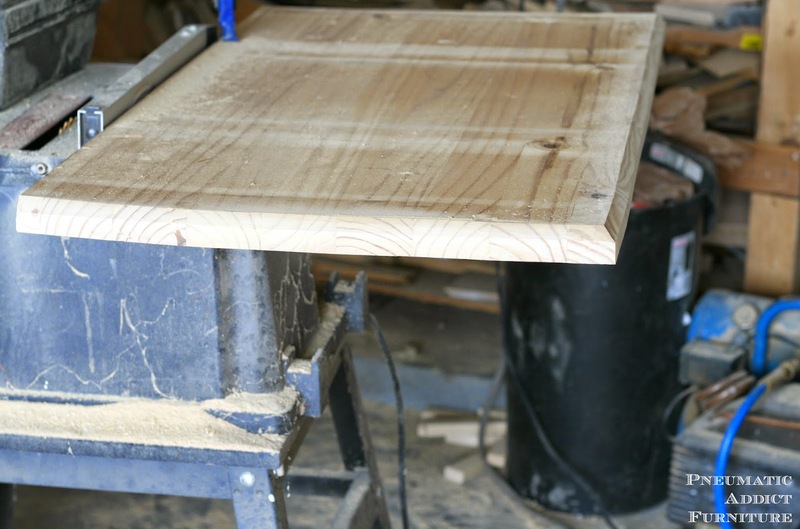 With a little cutting, it is a super inexpensive way to give your project a solid surface top. I used this trick on both my Printer's desk and Jordan dresser as well. I grabbed a spare, solid pine top and cut it down to size. Next, it received a good sanding and a chamfer detail routed around the bottom edge. (The photo below shows it upside down). Once again, I used more pocket holes, screws and glue to attach the top to the frame. 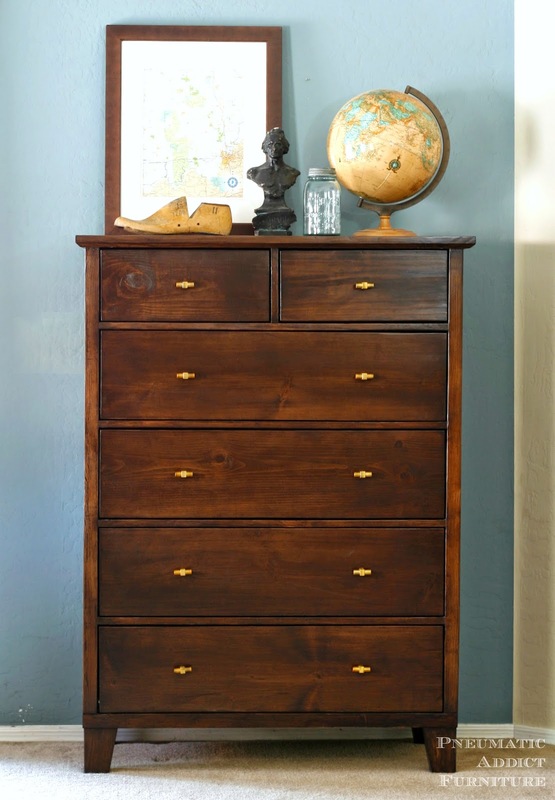 Remember, the dresser is most likely going to be up against a wall, so you want the top to be flush with the back of the frame. A good way to do that is to lie the dresser down on it's back while driving your screws. 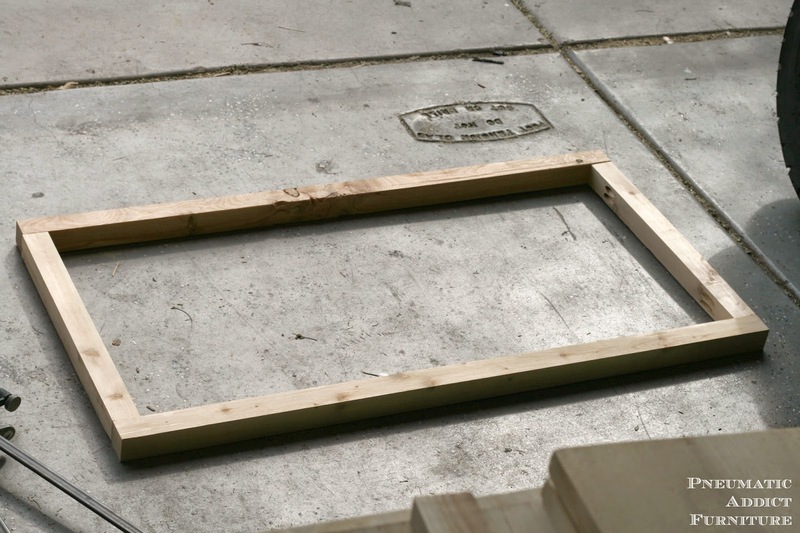 The next step is to add the backer board to the frame using either staples or small wood screws. I forgot to get a photo of that step, but its pretty simple. Cut down your backer board down to size. 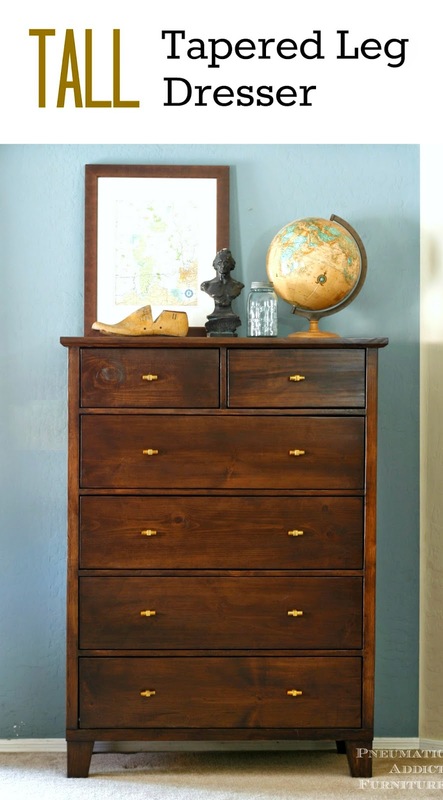 Measure opposite corners of the dresser frame to check for square. If it's not square, have a strong friend come over and help you push on the offending corner while you attach the backer board. 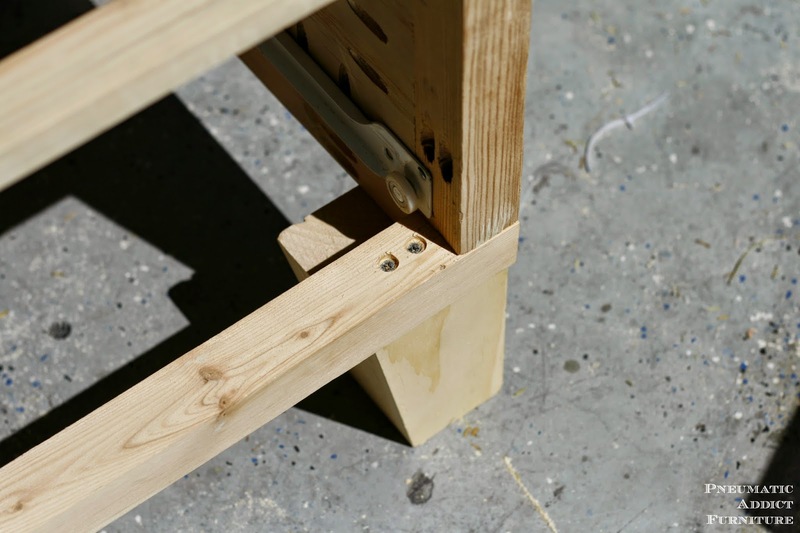 Once it's attached in several places, it should hold the frame square. When it comes time to add the drawer dividers, do as I say and not as I do! You want to attach the small vertical divider FIRST, before the longer, horizontal dividers. If you don't, you will have one heck of a time trying to drive the screws in the vertical piece. The problem is, the space is so narrow, you can't get your drill in the space and properly line up the bit on the screw. 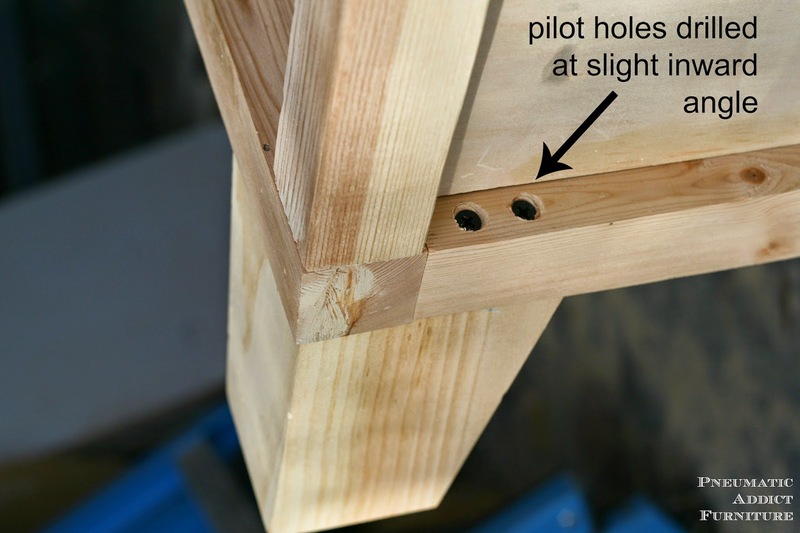 To attach it the right way; drive two screws through pocket holes at the top end of the vertical divider, add your next horizontal divider, and attach the two pieces together via screws drilled through the bottom of the horizontal piece. 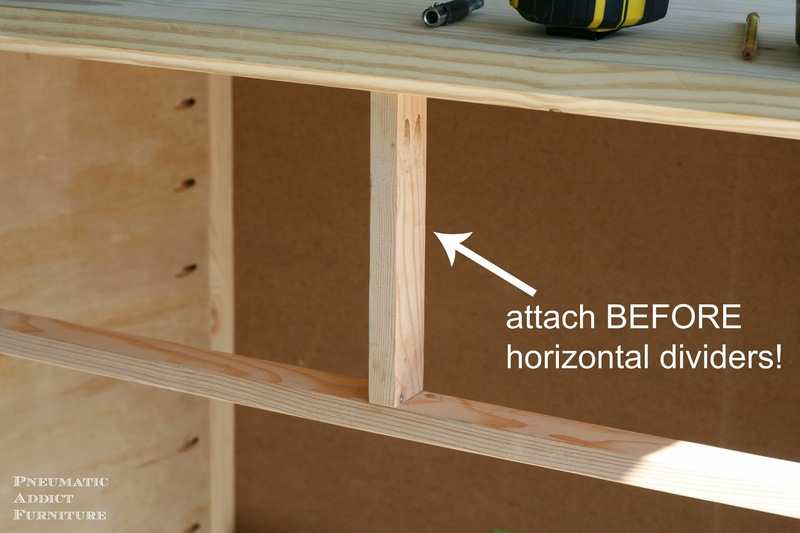 Make sure you countersink the screws so they don't stick out and interfere with the drawer face. Next, I added the rest of the drawer dividers, measuring each space about 100 times to make sure they were spaced evenly apart. Now, time to add the feet. My favorite part! I'm in love with these things. The guys over at Osborne Wood Products were so awesome and designed these two sided tapered bun feet for me. You can buy them here. They worked perfectly to match the inspiration dresser! I'm thinking about putting a set underneath my sofa to "modern" it up a bit. Unfortunately, with all the pocket holes going on the inside of the frame, there wasn't any space to add holes for attaching the bun feet. I drilled two holes in the bottom rail of the frame, and two more in the inset space beneath the side panel. I made sure to angle the pilot holes towards the center slightly, to accommodate for the taper. 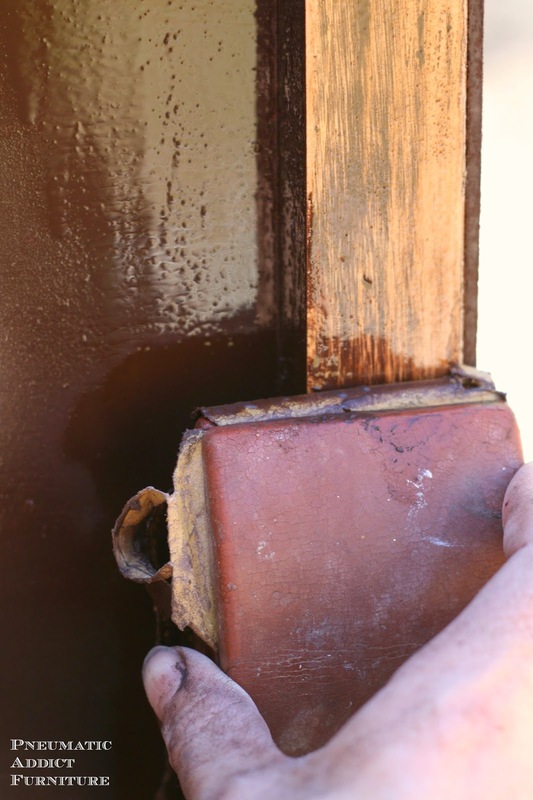 With the screw heads countersunk and covered with wood filler, you'll never see them. 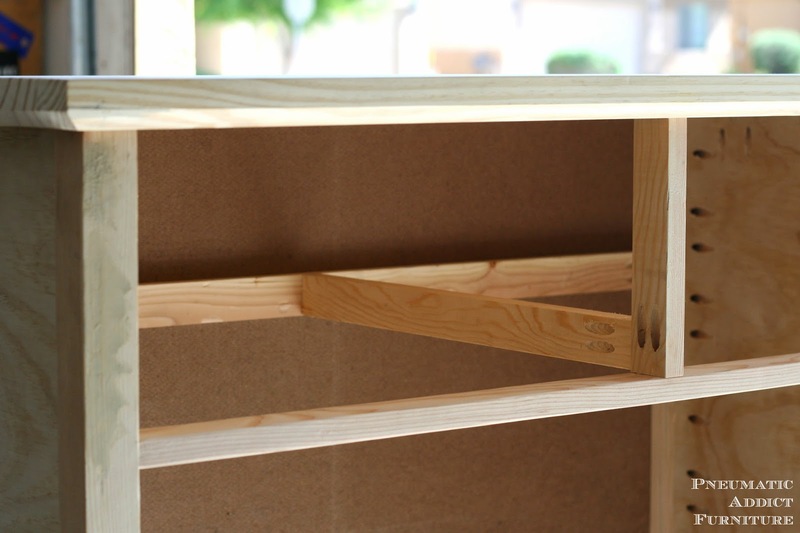 In order to attach the drawer slides for the top two drawers, you need to add a bit of frame work. Using my good ole *Kreg Jig again, I added a 1 x 2 across the back, parallel to the front, top divider. Then, I could attach another 1 x 2, connecting the back to the front frame. At this point, you'll want to add your drawer slides. Shanty-2-Chic has a great tutorial here. If you attach the slides first, THEN construct your drawer boxes, the whole process works so much better! Trust me! 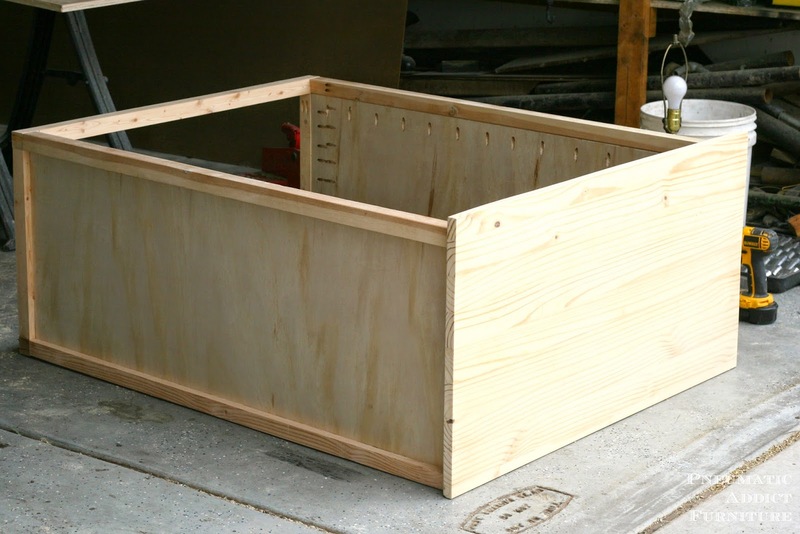 Build your drawer boxes, and then you're ready for finishing. If you follow me on Instagram, you saw that I had some drama over the first stain I used. Long story short, I made the mistake of not doing a sample board before applying stain to the ENTIRE dresser and hated the results. I spent the next day doused in mineral spirits, and sanding my fingers to the bone, all while cursing that dang stain. 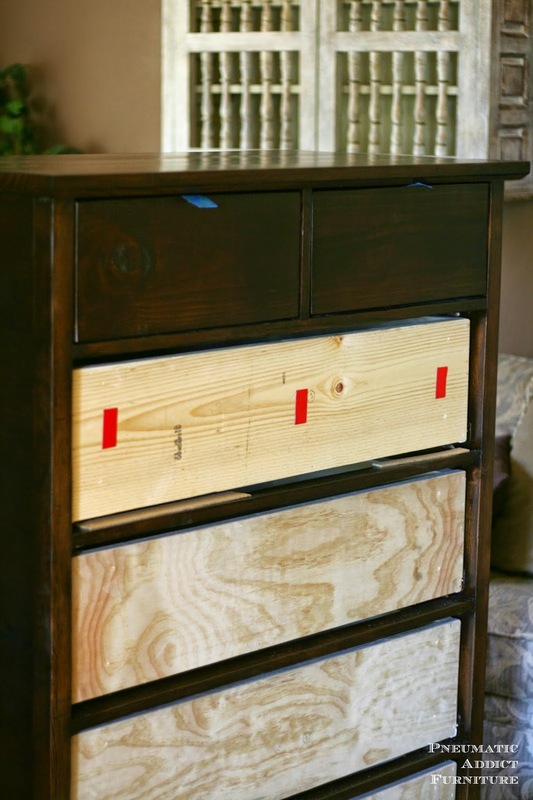 I used the same trick as when I built the Jordan dresser and utilized *outdoor mounting tape to hold the drawer faces in place temporarily. Then, I could gently pull out the drawer, and drive my screws from the inside of the drawer box. I've found with inset faces especially, this is the only way to go. 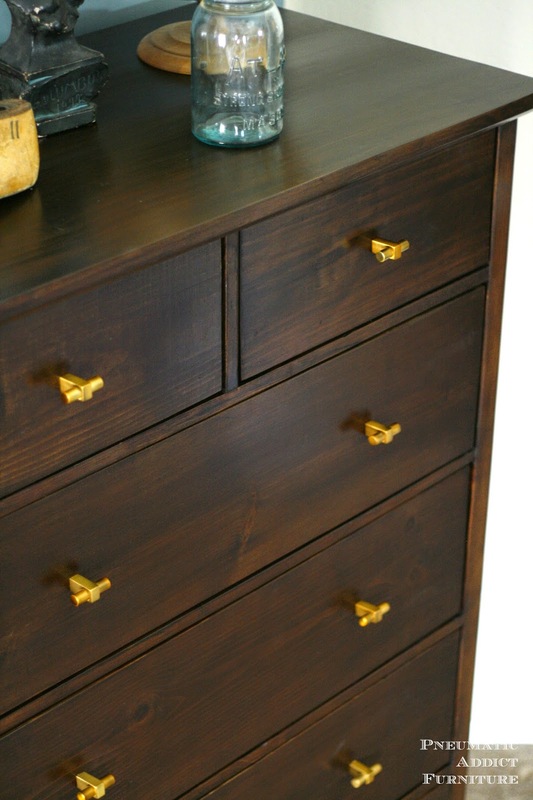 I added my pulls, which I found at D. Lawless Hardware, and here is the final look! Get a good look at those feet. They have a big brother which will be making an appearance on another project in the near future. I wanted to add a little more modern look with my hardware, so I went with something completely different than this inspiration. I freaking love these pulls! They are called the Artesia Knob in Sedona bronze. Not really a knob and not really bronze. More like a warm, aged brass, bar pull. They too have a big brother which you may see make an appearance down the road (wink wink). So what do you think? Are you ready to go get a copy of Amy's plans now? WOW, that looks amazing! Can you put in a picture of the back? Can you see the backerboard from the side, or did you inset it somehow at the back so you don't see its edge? Thanks! You amaze me. Lovely dresser ! Gorgeous!!! Holy guac It looks amazing! Great job Elisha! Totally pinned! Beautiful piece! Love the pulls too! Beautiful. How much did this cost to make? What type of wood did you use to build this?